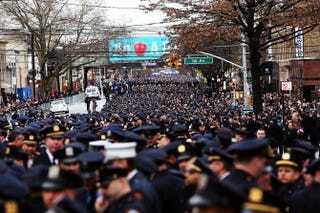 Police officers from across the country attend a funeral service for slain New York City Police Officer Wenjian Liu Jan. 4, 2015, in the Brooklyn borough of New York City. Officers Wenjian Liu and Rafael Ramos were killed in an ambush while sitting in their patrol car Dec. 20, 2014. Last December, when Karim Baker was stopped in Brooklyn, N.Y., by a man who appeared to be a random passerby asking for directions to a housing project in the New York City borough’s Bedford-Stuyvesant neighborhood, Baker had no idea that he was giving directions to the man who would shortly thereafter kill two police officers in cold blood, the New York Daily News reports. Now the former FedEx driver says that since that fateful day, he has been subjected to harassment by officers at the New York City Police Department, culminating in a brutal beating and an arrest by a group of cops Oct. 21 because of, he says, his inadvertent assistance to the killer of Officers Wenjian Liu and Rafael Ramo. According to the report, Baker says he had previously been stopped by the police 20 times, although never ticketed, for alleged traffic infractions. The NYPD acknowledged last month that it is looking into Baker’s arrest, after which he was taken to Elmhurst Hospital in Queens with a busted lip. Officers deny harassing him, however. Baker’s lawyer, Eric Subin, thinks it’s convenient that the NYPD does not document traffic stops for which motorists are not arrested or issued summons. The fed-up Baker intends to file a notice of claim Tuesday in Queens Supreme Court, according to the Daily News. It all began, he said, around 2:13 p.m. Dec. 20, when he bumped into Ismaaiyl Brinsley, who asked for directions to the massive Marcy Houses projects. Baker maintained that Brinsley didn’t act weird in any way. “Just a guy asking for directions,” he said. He thought that would be the end of the matter, but it wasn’t. Finally, last month, things escalated after he was stopped in Queens. Baker was charged with resisting arrest, criminal possession of a controlled substance, obstructing cops and parking within 15 feet of a hydrant, the Daily News notes. Baker is accused of refusing to show his ID, smelling of marijuana and resisting by “flailing his arms and wrestling” with officers, according to court records. Baker denies having drugs and said he was parked legally when he was beaten up by police, who approached him in an unmarked car, the Daily News reports.